Have you ever realized how many times in a day you use your hands? Granted, it would be nearly impossible to keep track, but without your hands, your life definitely would come to a sudden stop. Despite being so useful, most of us do not take care of our hands properly. This is one reason why people end up suffering from hand pain and reduced mobility over time. Many people also develop arthritis, a degenerative joint disease than can affect any joint in your hands. Hand arthritis is common in the wrist, the basilar joint that connects your thumb and wrist, the fingertips (DIP joint) and the middle knuckles of the fingers (PIP joint). When suffering from arthritis, the cartilage between your joints wears down and causes your bones to rub together without a cushion, which in turn causes inflammation, stiffness and pain. While the exact cause of arthritis is unknown, it does tend to run in families. Factors like aging, doing a job that requires a lot of hand work like manufacturing or typing, and some kind of a hand injury may also contribute to arthritis in hands. If you do not wish to suffer from stiffness, swelling or pain in your hands, exercise your hands daily. There are many exercises that can improve hand mobility and keep them strong. Here are the top 10 exercises to improve hand mobility. Making a fist and then releasing it is a good exercise for your fingers. You can do this easy exercise anywhere and anytime to get relief from hand stiffness. Hold your left hand out flat. Slowly bend your fingers into a fist, placing your thumb on the outside of your hand. Be gentle and avoid squeezing your hand too tightly. Unfurl your fist slowly, until your fingers are straight once again. Do the exercise 10 times with each hand. This easy stretch exercise helps keep the tendons functioning well. This in turn helps move all the finger joints through their full range of motion. Hold your hand out in front of you, with your palm facing you. Slowly bend your fingertips down until they touch the base of each finger joint. Your hand will look like a claw. Hold this position 30 to 60 seconds, then release. This is another simple exercise for your finger joints to work properly. You can do this exercise whenever your hands feel achy or stiff. Start with your right hand pointing straight up. Then, follow with your middle, ring and pinky fingers. Repeat this exercise 10 times with each hand. 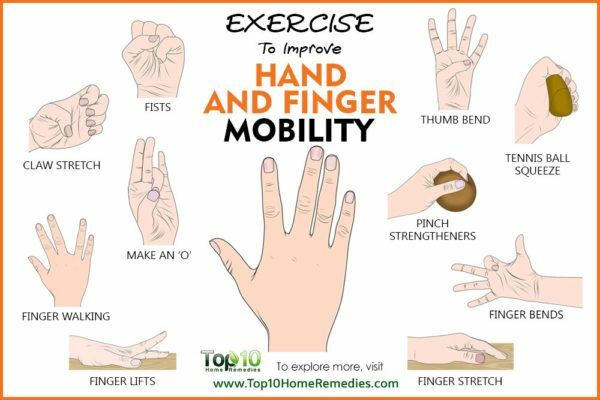 This exercise is very beneficial for those who suffer from rheumatoid arthritis and cannot move their fingers without feeling a sharp pain. In fact, this exercise strengthens the fingers in the opposite direction of a deformity. Put one hand on a table with your palm facing down. Slowly lift the index finger up and try to move it toward the thumb, then place the finger down. Next, lift the middle finger and move it toward the index finger. Then, lift the ring finger and move it toward the middle finger. Finally, lift the pinky finger and move it toward the ring finger. Repeat 2 or 3 times on each hand. This exercise helps increase the range of motion and flexibility in your fingers. It also makes the joints of your fingers strong. Place your right hand flat on a table, palm down. Lift the thumb slowly off the table. Hold the position for about 5 seconds, then lower it. Do the same with every finger of the right hand. Repeat the sequence with your left hand. Repeat 10 to 12 times with each hand. You can also lift all your fingers and thumb at once, and then lower them. This exercise is very similar to the finger lift exercise. All you need to do is bend your fingers inward instead of lifting them. Put your hand out and slowly bend the thumb down underneath your palm. Hold the position for about 5 seconds, then straighten your thumb back up. This is a simple stretching exercise for your fingers that helps with pain relief. Another benefit of this exercise is that it improves the range of motion in your hands. Put your hand palm-down on a table. Gently straighten your fingers as flat as you can against the table. Hold for 30 to 60 seconds, then release. This is a very easy grip-strengthening exercise that benefits the joints of your fingers as well as your wrists. This exercise also helps fight stress. Squeeze a soft tennis ball as hard as you can for 5 seconds, then release your grip. Repeat 15 to 20 times with each hand. Caution: Do not perform this exercise if you have a thumb injury. A strong thumb is important for a strong grip. To strengthen your thumbs and increase the range of motion in them, try this thumb bend exercise. Improved range of motion in your thumbs helps with activities like picking up your toothbrush, fork and spoon, and holding pens when you write. Hold your left hand out in front of you, with your wrist straight. Bend your thumb inward toward your palm as far as you can. Hold the position for 5 seconds, then return your thumb to the starting position. Now, try touching your thumb to each of your fingers one at a time. Do 4 reps of this exercise if possible. Repeat the whole sequence with your other hand. This exercise strengthens the muscles of your fingers as well as thumbs. It also increases mobility of your fingers. Hold a soft ball in one of your hands. Pinch a bit of the soft ball between the tips of your fingers and your thumb. 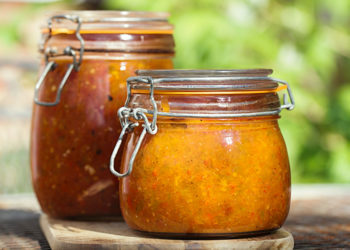 Hold the pinch for 30 to 60 seconds.